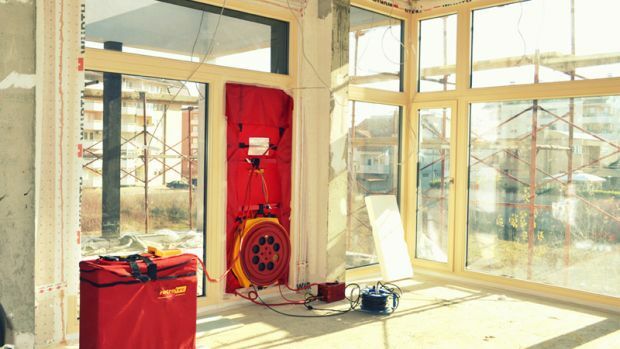 Dental clinic DUODENT in Macedonia proved a high level of air-tightness with a successful preliminary Blower door test. With the result of 0,2 h-1 (the maximum allowed for a passive house is 0.6 h-1) and the precise adherence to the project’s design the Dental Centre has all prerequisites to be a comfortable public building, providing a healthy indoor environment for its visitors. By achieving this level of air-tightness the building’s energy demand for heating and cooling is reduced from 10 to 7 kWh/m2 annually. The passive house designed by Studio APXE will be the Balkans’ first ecological healthcare building with close to net zero consumption. Moreover, it is the first passive house in Macedonia and the first public passivhaus building for the architectural studio.